The watermark (logo and large X) on the front of the card image does not appear on the printed product. days (M-F) and does not include time in transit. ** NOTE ** Type your custom prayer above and we will professionally design your card back and send you an e-mail proof for approval. You will have the opportunity to change or edit your card in any way you like. 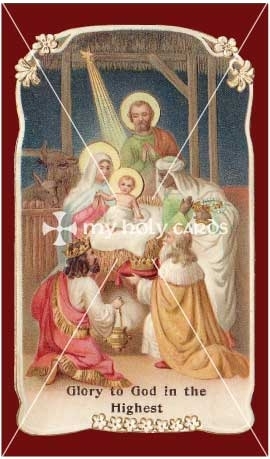 Click here to see ideas of card backs and prayers we have designed. NEED A PROOF COPY E-MAILED? MAY WE ADD OUR "MARK" TO YOUR CARD? May we use your card for social purposes? No, do NOT use my card info and text. YES, you may use my card info and text.